Crystal's dining scene has become less formal, with the late-2017 introduction of open-seating dining in the main dining room and two additional eateries with a more casual vibe. We loved having the choice of five restaurants at dinner, in addition to room service. All dinner venues are open from 6 or 6:30 until 9 or 9:30 p.m. While the food in the specialty venues nearly always hit the mark, we found Waterside, the main restaurant, to be inconsistent both with food quality and service. Order the right dish and it's exquisite; order the wrong one, and you'll leave feeling unsatisfied. The service was also not up to snuff, despite a not-full ship. Waiters would get orders wrong and get defensive about it; at one meal, they kept delivering my dishes to other diners at my table. They'd pour still water into your glass of sparkling without asking, and seemed disinterested in describing wine choices or offering alternatives if you didn't care for the daily selection. It simply did not live up to expectations. Specialty dining fans should note that passengers are limited to one complimentary visit to each of the ship's alternative restaurants, Umi Uma and Prego. Additional meals there cost $30 per person. Advance reservations are highly recommended to the alternative restaurants, including Silk (but not the Churrascaria). In addition, be warned that many of the specialty venues are loud, making dinner conversation tricky if you're in a large group. Waterside (Deck 5): The ship's main restaurant serves breakfast, lunch and dinner daily and is open seating for all meals. To accommodate this change in policy (the restaurant formerly offered two sittings for dinner), more tables for two and four have been added. Solo travelers, though, needn't feel compromised; a table is always set aside in Waterside for solo travelers to sit with other singles, should they wish. In addition, tables are set aside for solos in the specialty restaurants on select evenings. A note in Reflections will indicate the designated times and venues. Dinner is a multicourse highlight in Waterside. Two dinner menus are offered each night and both change daily. There's a "modern" menu that offers more daring dishes, and a "classic" that features more traditional fare. You can choose one or the other or even pick from both. Vegetarian items are marked. One waiter mentioned in an offhand manner that there were some always-available selections, like Caesar salad, not on the menu; we never saw an actual list, and no one else referenced it. On one night's menu, the "modern" choices included charred beef crudo as a starter, pan-seared duck magret as a main and macadamia nut crunch as a dessert. That same night's "classics" menu, which has six main dishes (compared to the modern menu's two), featured a forest mushroom tart appetizer, soup and salad, a pasta course (rigatoni puttanesca) and mains such as filet mignon, poached capon, tiger prawn and tomato curry and lentil "meatballs." There's also a substantial salad course for those who prefer a lighter entree or are looking for a change of pace. Desserts included a nice range of sweets, like trifle, tarts and creme brulee, with a couple of sugar-free options. You can always order ice cream, frozen yogurt, soft-serve, fresh fruit, cookies or a cheese plate. At each meal, you're presented with a red and white choice, but if you prefer a different varietal -- or beer, soda or a cocktail -- the wait staff will find it for you. In our experience, the wine steward just asked whether we'd like red or white, without describing or introducing the wines, so every time I had to inquire which exact red and white were on offer. An official kids menu does not exist, but the dining team will work with families to accommodate young diners. Among the standard dishes the chefs will make for kids are peanut butter and jelly sandwiches, chicken tenders, macaroni and cheese, fish and chips, pizza and hamburgers (or veggie burgers). At Waterside, breakfast is sumptuous, ranging from Basics (granola and fresh fruit, cereal and baked goods) to Classics (egg dishes, pancakes and brioche French toast) to Specials (steak and eggs, crab omelet). We loved the All-in-One concept, in which breakfast combos included easy-to-order and quick-to-eat options like The Continental (pastries and fruit), The Excursion (eggs, potatoes, meat and toast) and The Healthy (gluten- and fat-free muesli or egg white omelet). In keeping with the line's growing appeal in Asia, there's also The Chinese (congee) and The Japanese (miso soup, grilled salmon, steamed rice) breakfast. At lunch, the menu offers a good range of choices -- appetizers, salads, soup, a pasta dish, sandwiches and hot entrees. Entree selections are varied, including a main dish salad, dishes like lamb kofte and pan-fried plaice, a vegetarian entree, sandwich of the day and always-available burger (with or without cheese). You can add sides like French fries, mashed potatoes and steamed vegetables. There seem to be almost as many dessert options as mains, with two featured desserts (like vanilla macaroons or apple rice souffle), ice cream sundae and scoops (including fro-yo, sherbet and soft-serve), sugar-free option, fruit and cheese. Waterside is open for breakfast from 7:30 to 9 a.m., lunch from noon to 1:30 p.m. and dinner from 6 to 9:30 p.m.
Umi Uma & Sushi Bar (Deck 6): Umi Uma, formerly called Silk Road (Umi Uma means "sea horse," as featured in Crystal's corporate logo) is supervised by Nobu Matsuhisa, one of the world's most highly regarded celebrity chefs. The venue is open for dinner only. First of note is the restaurant's stand-alone sushi bar, offering both traditional and nouvelle varieties that are created as you watch. Passengers are pretty much limited to sushi choices here (a great stop for appetizers one night on our way to the Waterside Restaurant), but there are a handful of regular menu options offered, too, should you want to make a night of it. Sushi choices range from salmon tartar with caviar to white fish "new style" and also includes traditional favorites like California rolls. Anyone can dine at the sushi bar on a first come, first served basis. There's no cover charge. In the restaurant, decorated in sleek sea colors and highlighted by dark woods, passengers are offered two menus (one for sushi and the other for Nobu-style appetizers, entrees and desserts), and they can mix and match from both. Starters included creamy king crab, seafood ceviche and lobster spring rolls. There are also soups and salads. Entrees include Nobu-style lobster with truffle sauce and signature black cod with miso. The grilled wagyu beef ribeye steak is also marvelous. Desserts there, as they were everywhere onboard, were outstanding; the chocolate souffle cake with sesame ice cream and the sweet ginger creme brulee were deceptively light. Umi Uma is the most popular restaurant onboard, so make reservations early; you can pre-reserve online before leaving home. All passengers receive one complimentary meal at Umi Uma (excluding the sushi bar, which is a no-extra charge option at any time). Any additional visits incur a $30 per person surcharge. Tips for specialty dining are included in the cruise fare. 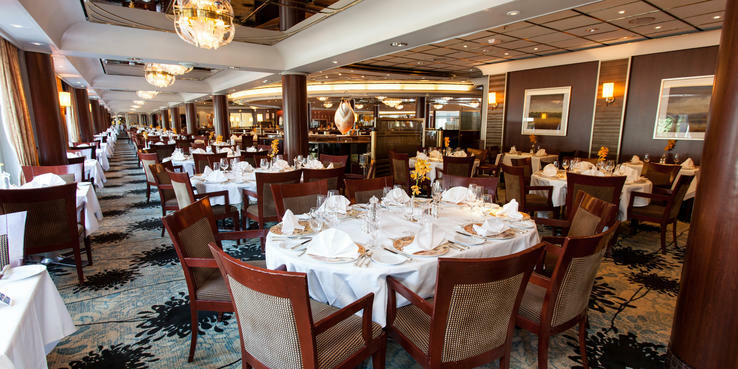 Prego (Deck 6): Prego, the ship's Italian restaurant, has been a Crystal stalwart since Symphony's launch; Piero Selvaggio, proprietor of Valentino's in Santa Monica, created it. The restaurant has since transformed its rather gaudy, pseudo-Venetian look into something stylish and luxurious. The reception area is deep wine-red, and the actual dining area, in stone and beige with chocolate suede walls, has a relaxing look. It's open for dinner only. Signature starters include beef carpaccio, mushroom soup served in a bread cup and lasagna alla Casalinga. These are all precursors to the main courses. Mains include osso buco, lamb rack, lavender-infused duck and branzino. Ask if there's a daily special; the tuna special we had was delicious. Desserts are exotically Italian (no ordinary tiramisu here) with choices that include affogato (espresso-flavored lady fingers, a twist on tiramisu), chocolate-bergamot cake, semifreddo, gelato, sorbet and cheese. Our dining table agreed that the deconstructed cannoli was disappointing; we would have preferred put-together cannoli done right. As with Umi Uma, the first meal is included, while additional visits cost $30 per person. Reservations are required. The Vintage Room (Deck 6): An elegant private dining room with rare wines displayed in glass cabinets, The Vintage Room can be booked for private parties or by individuals, provided a minimum of eight diners is reached (the maximum is 12). Book at reception. A variety of menus are available, and while the food is exceptional, it's really the wines you pay for, which include sought-after vintages from legendary growers, paired with every course and presented by the head sommelier. Lunch and dinner options are now available. Lunch, typically four courses, is $75 per person or $700 to reserve the room for a private lunch. Themed lunches are more expensive, such as the Californian wines lunch or Champagne lunch, both $125 per person. Dinner, typically six or seven courses, costs $250 per person or $2,500 for a private dinner. On occasion, an Ultimate Vintage Room Dinner is held that features incredibly rare wines and (usually) food prepared by a visiting celebrity chef and priced accordingly. The Bistro (Deck 6): In the morning, The Bistro is a great coffee bar for low-key breakfasts of fruit, yogurt, pastries and bagels, open as early as 6:30 a.m. At lunchtime, it transitions to cold cuts and cheeses and desserts, and is a popular spot for a glass of wine. Scones appear at teatime, and the options remain the same until 8 p.m. when it transitions to desserts and cheeses only until late. Marketplace (Deck 11): For casual dining, Crystal Symphony's Marketplace is the vessel's buffet venue for breakfast and lunch. Its design makes it feel both summery and elegant, with individual travertine islands that allow the food to be displayed elegantly and reduce queuing. Tables are available both indoors and out on the aft deck. The Marketplace is typically open from 5 a.m. for early risers' coffee, adding continental fare at 6 a.m., with the full buffet available from 7 to 10 a.m. Staples include fresh fruit, yogurt, oatmeal, cold cuts and cheeses, pastries, French toast and pancakes, and an omelet station. There's also a breakfast bar with dishes that are aimed at Asian passengers (fried rice, congee), and healthy alternatives such as quinoa, salad lettuce and toppings like flax seeds. Order beverages from the roving bar staff (or pick up the juice blend of the day at the buffet), including unlimited, fresh-squeezed orange juice. Lunches in the Marketplace (from noon to 1:30 p.m.) generally feature the same dishes offered in Waterside but also include additions. The salad bar has lots of fresh lettuces, veggies and other toppings (including seeds, tuna and hard-boiled eggs), in addition to premade salads. There's a carving station, hot dishes (with gluten-free but not vegetarian options marked), a pasta station, deli meats and cheeses, a hot dessert and a selection of small cakes and pastries. Churrascaria (Deck 11): A new addition in the 2017 refit, it's the ship's nod to South American cuisine, located in a section of the Marketplace. It's open daily for dinner only and is open seating, with no cover charge. Dinner is a mix of waiter service and buffet. Start with a buffet of salads, ceviche, soup and tapas -- but don't go overboard. The meaty main event is quite heavy, with waiters coming around with seven types of meat on large metal skewers; you tell them how much of each type you want and use a flip card to indicate when you're ready for more and when you've had enough. Options include Parmesan chicken, garlic shrimp, herby lamb chops, sirloin steak, sausage, pork and short ribs. (There's some thought that the best cuts -- like the lamb and steak -- come out last, so pace yourself accordingly.) A caipirinha welcome cocktail is offered and wines poured as per the ship's other restaurants. Churrascaria might not be the most exciting venue for vegetarians, but non-meat-eaters won't go hungry. There are plenty of salad options and sides, both on the buffet and served family-style at the table, as well as the delicious Brazilian cheese bread served with the meal. Don't miss the grilled pineapple with cinnamon dessert, also shaved off skewers tableside. If you're interested in churros or other South American sweets, you can hit the dessert buffet -- if you can possibly squeeze more into your already bulging stomach. Silk occupies the area formerly taken by the Trident Grill and the ice cream bar, both of which are now housed in a slightly smaller space next door. The decor is dramatic, all shocking pink and black, with an eye-catching installation of china plates along one wall, some bearing faces. Living walls add splashes of lush green and a bar next door is perfect for pre-dinner cocktails, with rattan deck furniture and wonderfully comfortable pink-and-black swinging chairs. The whole area is covered by a retractable glass roof, so is filled with light whatever the weather. Despite a new air-conditioning system in that area, the center of the room can get quite hot on sunny days. At lunch (open a bit later, at 1 p.m.), Silk has a casual vibe, and passengers will sit here who ordered from the Trident Grill or picked up food at the Marketplace. Start with dim sum such as (steamed pork buns or shrimp dumplings), won ton soup or a chicken salad. Four mains include vegetable or beef noodles, Hainan chicken, shrimp or vegetable fried rice and a daily special. While a few options can be made vegetarian, choices are limited. When evening comes, the low lighting and eye-catching décor give the venue a trendier feel. The menu has a similar style to the lunch offering, but is dressed up a bit and all served family-style. As with lunch, you can start with dim sum, soup and/or salad; we thought the salad was far superior to the dumplings. Mains include Chilean sea bass, Kung Pao chicken, Mongolian lamb chops and stir-fried beef. The only truly vegetarian dishes are steamed rice and seasonal vegetables; it's unclear why a tofu dish could not be added to the menu. Desserts are a bit out of the ordinary; the tapioca "soup" with matcha ice cream and Chinese five spice dark chocolate slice (essentially a mousse tart) were yummy. Silk Kitchen & Bar is open for lunch and dinner (reservations required at dinner), at no charge. Trident Grill (Deck 11): A huge hit, the Trident Bar and Grill, located midship, serves up made-to-order fast food like Reubens, burgers (chicken, beef, salmon and veg), tuna melt, hot dog, chili con carne, soup and pizza. We loved the sweet potato fries, but you can indulge with regular fries or onion rings. It also offers a late risers' breakfast, with hot dishes made to order, from 10 to 11 a.m. There are only a handful of tables in the small area the grill shares with the ice cream bar. Most diners take their meals out to the pool deck or to the dining tables in Silk and the adjacent Silk Bar. (You'll find the breakfast menus on the tables in Silk, even though it's the Trident Grill kitchen in use in the morning.) The Trident Grill is open from 11:30 a.m. to 6 p.m. daily. Scoops Ice Cream Bar (Deck 11): A favorite of both kids and adults, Crystal Symphony's ice cream bar serves up varying flavors of Ben and Jerry's ice cream in cups or cones. We also loved the toppings menu that's got sauces like chocolate and caramel and toppings like cookies, nuts, sprinkles and M&Ms plus liqueurs to splash on top. The Ice Cream Bar is open from 11:30 a.m. to 6 p.m.
Palm Court Tea (Deck 11): Afternoon tea is a pleasant ritual on Crystal, and a formal interpretation takes place in the ship's Palm Court, with waiters dressed in tuxedoes with tails. The regular events feature tea sandwiches, scones with jam and whipped cream (clotted cream only comes in a packet), petits fours and tea served in delicate China teacups. Don't miss the themed tea events, which include the Chocolate Tea, Valentine's Day Tea and -- our favorite -- the Mozart Tea. The latter spread includes croissants and crustless white bread sandwiches and, more importantly, decadent desserts like Black Forest cake, Vienna Sacher cake and linzer torte. The hot chocolate "Amadeus" (rum, whipped cream and shaved chocolate), a specialty drink at the Mozart Tea, is absurdly delicious. Room Service: Room service is available around the clock and includes a variety of soups, salads, sandwiches and desserts, along with hot items that range from pizza and spaghetti to beef tournedos and burgers. Breakfast can be ordered the night before, via a card you hang on your doorknob, and includes hot and cold dishes. All passengers can order room service off the Waterside menu of the day, while passengers in Penthouse-category suites can also order from the menus of Prego and Umi Uma if they wish, and butlers will serve meals course by course.